“Unmasking the Greatest Mystery” from Christian Faith Publishing author Timothy S. Mehl is an inspiring true story of how a man raised from boyhood in his parents’ fundamentalist church outgrew the unquestioning doctrines and, from age eighteen, set out to find out for himself what the Bible holds. The rewarding result of this long, difficult journey is now encapsulated in these pages. “Unmasking the Greatest Mystery”: an illuminating testimonial about the resounding truth of the Bible as discovered by a self-taught seeker. “Unmasking the Greatest Mystery” is the creation of published author Timothy S. Mehl, a homegrown farmer and rancher who taught plumbing, heating, and air-conditioning at a technical college while raising a family of six children with his wife of forty-seven years. Published by Christian Faith Publishing, Timothy S. Mehl’s new book is an astute and spiritually rewarding checkpoint in the author’s lifelong quest to understand the Bible, a starting point for yet another journey to spiritual maturation. Readers can now join the author as he undertakes perhaps one of the greatest adventures in the Christian walk of faith—that of initial doubt, slowly unraveling to reveal the treasure behind the mystery. View a synopsis of “Unmasking the Greatest Mystery” on YouTube. Consumers can purchase “Unmasking the Greatest Mystery” at traditional brick & mortar bookstores, or online at Amazon.com, Apple iTunes store, or Barnes and Noble. 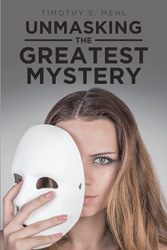 For additional information or inquiries about “Unmasking the Greatest Mystery,” contact the Christian Faith Publishing media department at 866-554-0919.